Among the approximately 2000 members of the Canadian Expeditionary Force killed at the Second Battle of Ypres in late April and early May 1915 was the only Canadian YMCA worker killed in combat during the First World War. YMCA Honourary Captain Oscar Irwin, attached to the 10th Battalion of the CEF, was killed when he joined the battalion as it set out to retake St. Julien from the Germans in the early morning of April 23rd. Irwin appears frequently in the YMCA’s commemoration of its First World War service, as the heroic embodiment of the YMCA’s masculine ideals, its message of service, and as a symbol of Christian sacrifice. Irwin’s example, both in life and in death, provided a venue by which the YMCA and its workers could address the tensions and challenges faced by many men involved in non-combatant service during the First World War. Originally from Collingwood, Ontario, Oscar Irwin was educated at the University of Toronto and trained for the ministry at Knox College. He was 29 years old and working as a pastoral assistant at Victoria Presbyterian Church in Toronto when the war broke out; he became one of the first men to join the YMCA service. Irwin accompanied the First Contingent of the CEF across the Atlantic in October 1914, and then to France at the beginning of 1915. The YMCA service consisted of a small force of YMCA officers recruited to accompany Canadian soldiers to Europe in order to minister to their spiritual, moral, and recreational needs. This recruitment effort met with success in Canada because the YMCA “had not only a large lay force of committee and board members from which to draw, but a considerable body of secretaries and young leaders-in-training ready for work in military camps.” At the height of its war effort the Canadian YMCA mustered 275 secretaries and officers, along with 350 soldier assistants and 3000 volunteers. YMCA officers wore the uniform of a Canadian officer and played a part in the national war effort, yet did not participate in the fighting – in other words, they were denied the most active, “manly” part in what many came to see as a religious crusade. This tension proved difficult for Irwin. Surviving letters from Irwin to his fiancée as well as memoirs and other papers written by the officers and men who served with him, show that although Irwin believed in the work of the YMCA and in its Christian mission among young men, he struggled as a healthy young man of military age, with his role as a non-combatant among soldiers. The longer he worked with the 10th Battalion the more Irwin augmented his YMCA work with active military work, accompanying patrols, spending more and more time in the front lines, training with the unit, and working towards a transfer into the Canadian army as an infantry officer. It was during this transitional period that Irwin was killed while leaving the trench to rescue a wounded soldier in no man’s land. He was thirty years old. The fact that he was a young man would have been the exception rather than the rule for YMCA honourary officers, and younger YMCA members and volunteers were generally recruited directly into the CEF. Irwin’s experiences, however, highlight some of the difficulties for YMCA officers in the field with the CEF. For young YMCA officers like Irwin, there likely would have been significant indirect pressure that would have led to him deciding to transfer to the CEF and begin training as a frontline officer. Irwin appears frequently in the YMCA’s commemoration of its First World War service, his death seeming to embody the Muscular Christianity that so deeply influenced the YMCA in the late 19th and early 20th centuries. His death also served to bridge the difficult gap between the non-combatant status of the YMCA workers and their involvement in the very masculine world of war. In a commemorative booklet published in 1915 written by Charles Bishop, the General Secretary of the Canadian YMCA, Irwin was lionized as a YMCA worker “serving the soldiers in a way that none of them who survived would forget,” bearing witness to “his Christian character as he labored among them in the name of his Divine Master and King.” Bishop wrote that Irwin joined the men in their charge at St. Julien “though he could have remained behind had he wished, as a non-combatant,” offering a vision of Irwin, and by extension the YMCA worker, to represent the same virtues as the soldiers themselves. Irwin’s death at Ypres provided an inspiring example of Christian sacrifice for other YMCA secretaries and gave the YMCA a hero that could symbolize for them the ultimate in Muscular Christianity that the YMCA sought to instill. However, this heroic death resulted not from Irwin’s service as a YMCA secretary but rather as a potential combatant who, through a situational need, was allowed to join the advance. It was only because Irwin had initiated the process to transfer from the YMCA service into the CEF as a commissioned officer that he was allowed to join the attack on St. Julien which put him in harm’s way and resulted in his death on April 23rd. This conflicted identity – combatant or non-combatant? – is further reflected in how Irwin is commemorated. 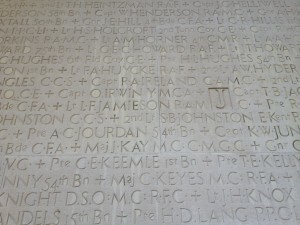 His name appears on both the Menin Gate memorial in Belgium among the 55,000 Commonwealth soldiers whose graves are unknown, and on the memorial wall at the University of Toronto, commemorating UofT alumni and students who lost their lives. In both places, though he is included among those who were killed in action, he is marked out as an Honourary Captain in the YMCA service, thus denoting his non-combatant status. In recent years there has been a significant body of work addressing the history of non-combatant participation in the modern world of warfare. These analyses have tended to focus on histories of medical personnel, chaplains or soldiers filling various logistical and service roles. Despite the challenges faced by these individuals in reconciling their participation as non-combatants, they were integral components of military structures and had long-established and universally recognized roles. They also have opportunities for heroism, ministering to dying soldiers in no-man’s land, retrieving wounded soldiers from the front lines, or bringing up ammunition and supplies under fire. Not only were YMCA personnel non-combatants, they served as members of a non-military service organization that was only informally integrated into the military hierarchy. As such, the experience of YMCA workers like Oscar Irwin, provide a new and compelling venue for exploring the meaning of masculinity in time of war. Jon Weier is a PhD Candidate in the History Department at Western University. His thesis is a transnational history of the First World War work of the YMCA. He regularly posts on twitter as @jonweier. Charles Bishop, The Canadian YMCA in the Great War, (Toronto: Canadian National Council YMCA, 1924), 43. University of Toronto, Roll of Service, 1914-18, (Toronto: University of Toronto, 1919) 73. Murray Ross, The YMCA in Canada: The Chronicle of a Century, (Toronto: Ryerson Press, 1951), 278. Bishop, The Canadian YMCA in the Great War, 286. 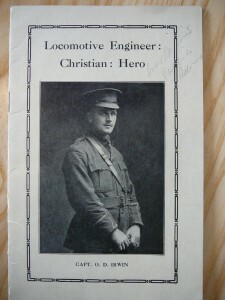 Charles Bishop, Locomotive Engineer: Christian: Hero, (Toronto: Canadian National Council YMCA, 1915), 5-6. Bishop, The Canadian YMCA in the Great War, 43-4. This is a fascinating article.. Reminds me of a story told to me by a man who works here at Maplewood by the name of Fox. His grandfather Rev.. Fox) was a vet of WW I then became a minister and was one of the four chaplains that went down with the ship the German U-boat sank off the coast of Greenland in WW II. I am a faculty member at Knox College in Toronto where Oscar Irwin was a student. On the memorial plaque in our chapel, we have listed an “Oscar Thomas Irwin.” Is this the same person as the one you write about?